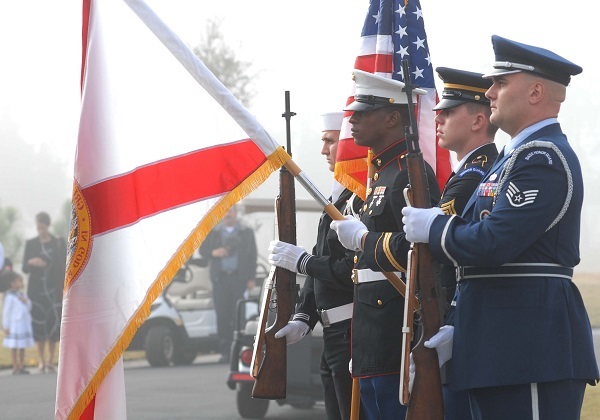 Florida has nine National Cemeteries (Barrancas National Cemetery in Pensacola, Bay Pines National Cemetery in St. Petersburg, Cape Canaveral National Cemetery in Mims, Florida National Cemetery in Bushnell, Jacksonville, Sarasota, South Florida National Cemetery in Lake Worth, St. Augustine and Tallahassee). The U.S. Department of Veterans Affairs provides honorably discharged veterans, spouses and dependents with burial in a National Cemetery at no cost. Cremated remains are also accepted. Eligible spouses and dependents may be buried if they predecease the veteran. The VA does not make funeral arrangements. To make burial arrangements at any open VA national cemetery at the time of need, call the National Cemetery Scheduling Office toll free at (800) 535-1117. The VA also provides eligibility determinations for interment in a National Cemetery prior to the time of need. Through the Pre-Need Determination of Eligibility Program, upon request, individuals can learn if they are eligible for burial or memorialization in a VA national cemetery. Burial benefits available for veterans buried in a private cemetery may include a Government headstone, marker or medallion, a burial flag and a Presidential Memorial Certificate, at no cost to the family. Some veterans may also be eligible for Burial Allowances. There are not any VA benefits available to spouses and dependents buried in a private cemetery. The VA does not make funeral arrangements. Call toll free (800) 697-6947 or visit www.cem.va.gov for more information.